Successfully Added Digital Infrared Ear Thermometer - 3 Color Backlit Display, Auto Power Off, Temperature Unit Conversion, Fever Alarm (Pink) to your Shopping Cart. The infrared ear thermometer efficiently measures body temperature and clearly displays the readings on its digital display. The infrared ear thermometer is an easy way to quickly measure body temperature. It’s compact, convenient and displays the measurements clearly on a digital display. The backlit display will also change color according to the temperature level, providing easy visual cues: if the temperature ranges from 34.0 to 37.3°C, the display will turn green; if the temperature is higher from 37.4 - 38.0°C, the color of the display will switch to orange. Finally, red display color indicates a high fever from 38.1 - 42.9°C, meaning that you need to see a doctor as soon as possible. The thermometer comes with an easy converter between Fahrenheit and Celsius and will give you the temperature reading within 2 seconds. 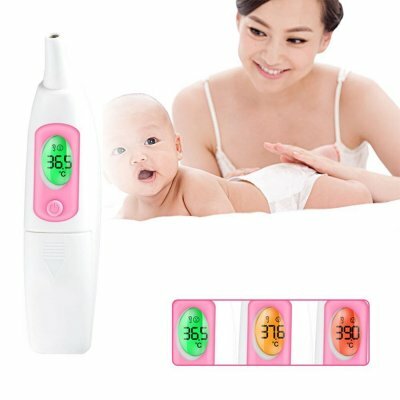 The thermometer is easy to use and can measure the temperature from the range of 3-5cm. You can also get a set of disposable ear caps to measure the temperature of multiple people (or in a school, medical establishment or kindergarten) or quickly wipe down the thermometer after every measurement. The Infrared Digital Ear Thermometer comes with a 12 months warranty, brought to you by the leader in electronic devices as well as wholesale infrared ear thermometers..